Thrash lords Slayer have unfortunately had an up-and-down year, between the death of founding guitarist Jeff Hanneman and the money issues with drummer Dave Lombardo that led to his departure and the reinstatement of former skinsman Paul Bostaph. The Slaytanic legends are ending the year on a high note, though, by unveiling a hefty vinyl reissue campaign. Due December 10 through American Recordings, the reissue project brings 10 Slayer releases back onto vinyl, with many for the first time since their initial release. 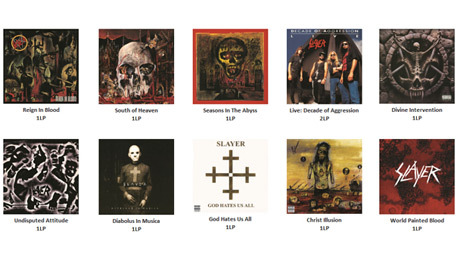 This includes 1986's seminal Reign in Blood, 1988's South of Heaven, 1990's Seasons in the Abyss, 1994's Divine Intervention, the 1996 covers set Undisputed Attitude, 1998's Diabolus in Musica, 2001's God Hates Us All, 2006's Christ Illusion and their most recent studio set, 2009's World Painted Blood. Additionally, a double LP of the band's concert collection Decade of Aggression: Live is also being pressed up. "Slayer defines speed metal and these albums define Slayer," American Recordings owner, record producer and Slayer studio collaborator Rick Rubin said in a statement. "Listen at your own risk." All the recordings have been remastered from the original tapes and are being preserved on 180-gram vinyl. They'll each feature their original artwork, as well as reproductions of the original 12x12 inner sleeves. While each release will show up on standard black vinyl, the press run for each release also includes 500 copies on 180-gram blood-red vinyl. Copies are being sent to stores at random. Slayer recently ran through a number of Canadian cities on their fall North American tour with Gojira, which ends tomorrow (November 30) in Boston. You can read Exclaim! 's take on last week's stop in Toronto over here here.